Only with proper planning can you be assured that your loved ones will not be subjected to unexpected disasters due to your failure to plan. Without a trust, your estate will be supervised by the Probate Court and there are high legal fees associated with court control. A Trust avoids the expensive, lengthy, emotionally draining and public probate process. 3. Guardians for Minor Children. Who do you choose to raise your children if you pass prematurely? It is crucial that you name a legal guardian in your will so YOU make the decision about who will care for your children. 4. Manage Affairs in the Event of Incapacity. In the event that you are unable to make decisions for yourself, who will make those decisions on your behalf? By creating a durable power of attorney and an advanced healthcare directive can you be sure that your financial and personal affairs will be handled according to your instruction. If you own a business, proper planning can ensure that the business survives and continues on in accordance with your plan. 6. Minimize or Eliminate Estate Taxes. You can prevent your assets from being subject to estate tax, which will allow more of your estate to be enjoyed by your loved ones. You can make gifts to your favorite charity or other worthwhile causes, while potentially getting income and estate tax benefits. Without a proper plan, your spouse or partner may not receive the property you intended to provide. For example, unknowingly holding property in joint ownership with someone other than your designated recipient may have undesired results down the road. 9. Establishing Trusts for Minor Children. A good plan can preserve your assets for your children’s use and prevent those inherited assets from being wasted or lost by careless habits and harmful addictions. 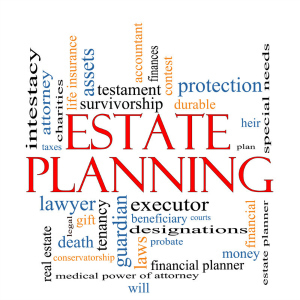 By creating an estate plan you have wide latitude to choose who will receive your estate, what they will receive and when they will receive it. You may distribute among your children equally or you may choose to eliminate one or all of them. You have complete control over your estate, rather than allowing the legal system to do it for you.